You must currently be registered with NC Works to be referred on any of our jobs. Go to www.ncworks.gov to register or update an existing registration. Job listings for all of North Carolina may also be accessed. Call NC Works Career Center, Lincolnton, 704.735.8035, or come to NC Works Career Center-Lincoln County, 529 N Aspen St., Lincolnton. 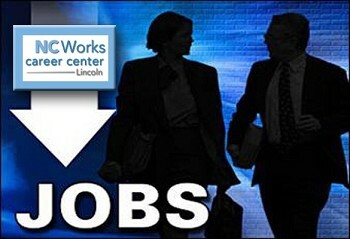 JOB FAIRS --- Employers are holding job fairs on various dates in the NCWorks Career Center-Lincoln. Please call for dates and times. Multiple manufacturing positions available. ADMINISTRATIVE SUPPORT ASSISTANT JOB NUMBER 11065222 --- Plans and organizes work flow to accomplish needs. Screens calls and inquires; receives and greets visitors; secures and gives information; handles public and employee requests for services or information. Composes and types correspondence, memoranda, notes, reports, and other materials; reviews work for compliance with instructions, spelling, punctuation and basic grammar; proofreads final proof of materials. CUSTOMER SERVICE REPRESENTATIVE JOB NUMBER 11066801 --- Enter Purchase Orders, Purchase Order Acknowledgements, Advanced Ship Notices, Invoices, Shipping information, and complete order changes in an external Web Site for all Catalog Accounts as needed. Match shipped orders with Invoices, credit memos with orders, and Return Material Authorizations with Orders for Catalog Accounts and file daily. Work individually with the Catalog Accounts. MAINTENANCE SUPERVISOR JOB NUMBER 11061966 --- Oversee and manage the maintenance and housekeeping departments of the facility including the repair, maintenance and installation of machines, tools and equipment. Serving as the first-level of management, accountable for the performance and outcomes of the team. Manage work schedules, productivity and labor budget and expenses. Administer branch technician's bonus program. FACILITY OPERATOR II JOB NUMBER 11063949 --- Performs scheduled plant inspections, and serves as Operator in Responsible Charge of assigned systems. Monitors gauges, meters and control panels; and controls variations and operating conditions of the treatment process. Records meter and gauge readings. Maintains all records pertaining to production, maintenance and treatment as required including reading charts, flow meters, and gauges to detect equipment malfunctions. CERTIFIED NURSING ASSISTANT JOB NUMBER 11063713 --- Provides personal care and services to assist with activities of daily living, obtains and records vital signs and weight as assigned, accurately documents all care as required by company policy and in compliance with state and federal regulations. Provides non-resident services such as, but not limited to, washing wheelchairs and cleaning resident/patient areas in compliance with infection control procedures. RECEPTIONIST JOB NUMBER 11061011 --- Employer seeking candidate to answer phones, check insurance, and enter patient information. Will have face-to-face patient contact and must have the ability to multi-task. Must have 1 to 2 years’ experience. DUMP TRUCK DRIVER JOB NUMBER 11066164 --- Employer is seeking dump truck drivers to haul and deliver products (asphalt, gravel, dirt). Requires Class B CDL. Dump truck driver experience is preferred but not required. Prefer that applicants have no major traffic violations in the last 3 years. Willing to train the right person. ADMINISTRATIVE ASSISTANT I JOB NUMBER 11066905 --- Prepares correspondences, including reports, and distribute via e-mail, mail, overnight shipping, etc. Direct phone calls and messages, make copies, distribute mail and order supplies. Responsible for the operation and maintenance of office equipment and provide computer training and assistance to division staff as needed. Maintain general files and records. SCHOOL SYSTEM JOBS --- A local school system is filling positions for the upcoming school year. There are many different positions available.